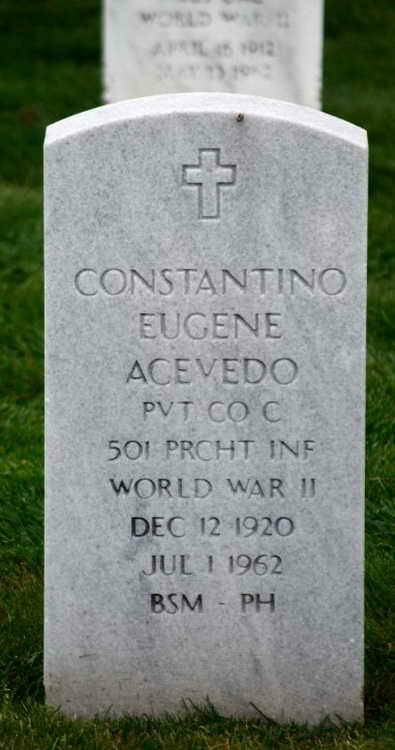 Grave marker for Constantino E. Acevedo in Plot X, 0, 571 of the Golden Gate National Cemetery, San Bruno (San Mateo county), California. Constantino was a native of Nicaragua and enlisted in the Army at San Francisco, CA on 24 November 1942. He was attached to Hq 1st 508th PIR as a Flag Orderly from Hq 2nd Army Umpire School during the Tennessee Maneuvers.